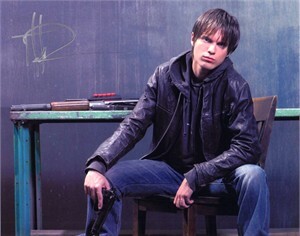 8x10 Terminator The Sarah Connor Chronicles photo autographed in silver by Thomas Dekker, who played John Connor. ONLY ONE LEFT. Obtained in person at San Diego Comic-Con, with certificate of authenticity from AutographsForSale.com. LAMINATED FOR PROTECTION.